In my headcanon backstory for the background characters, the couple in the blue and green are discussing philosophy (poorly) while the guy with the book tries not to be too obvious about sneaking glances at Blue. oooo, I see lipstick; working on that crush, Mina? Every single one of my Friday updates feature eyebrows leaving their faces!! Yes, that is definitely a philosophy beard on Green Sweater Guy. I always see Mina as petite, or near petite, anyway. Ha. That lady looks like she’s reading something inappropriate in public. Dave, I love the detail of the tables and the cups! Wonderful!! It does look a bit off, but I think it might be because Dave’s character’s don’t really have lips. To me, it looks like she’s got too much lipstick. Looking back, it’s not the first time she’s wearing lipstick. 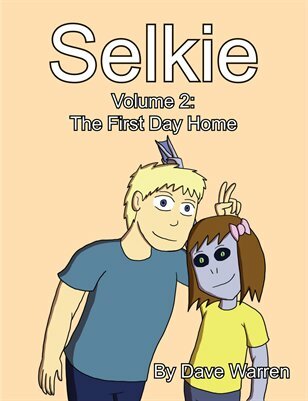 She looks better in this one https://selkiecomic.com/comic/selkie539/ . It’s not so much because the characters don’t have lios as it is because the lipstick completely surrounds her mouth in this artwork, like the lips in minstrel blackface makeup. In the page you linked, her lipstick is just on the top and bottom, and looks particularly realistic (and, in my opinion, nice) because it more or less mimics the curvature of real human lips. Well, to be fair, it wasn’t officially agreed to being a date. 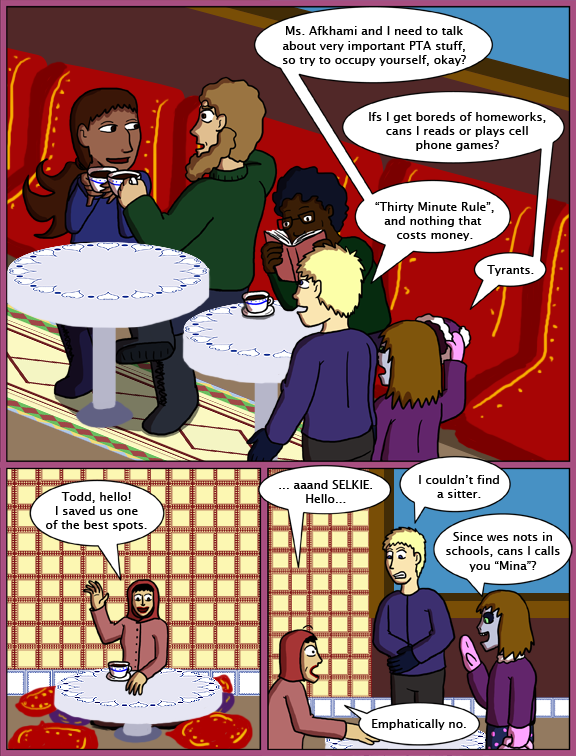 Gee, with Selkie there, Todd and Mina may actually have to talk about the PTA meeting. You can practically hear her face fall. With a nice loud ‘thud’ as her jaw hits the floor. Dang, she must never wear makeup. She looks like a clown.